Are you a homeowner interested in solid surface counters and looking for a way to save on your Avonite cost in Maryland. Avonite’s designs and style make it popular with homeowners in places like Baltimore, Annapolis, Alexandria, and many other cities throughout Maryland and Northern Virginia. After installing thousands of Avonite countertops we’ve determined some steps you can take to bring down your cost and make your countertop more affordable. Keep reading to learn more about saving on Avonite countertops and you’ll learn all about the steps you can take to get the counters you want without breaking your budget. If you’d like to talk to with a countertop expert who can answer all of your questions, call 410-712-0601today. You can also click here to request a free, no obligation estimate. Avonite counters became popular thanks in part to having been installed in places like high-end restaurants, where they could easily complement the ambience of the room. Many homeowners wanted to then use that same material to create a sophisticated atmosphere in their own kitchens. If your goals are along those lines, then here is what you need to know about before you begin looking for the counters you’ll be putting in your home. Think About the Countertop Design – Colors and patterns play a large part in how much you’ll be spending for Avonite prices, but money can be saved if you shop smart. Consider going with avonite countertop colors and patterns that aren’t as popular as the top sellers and you can save some money on your countertops. In addition to that, you’ll have counters that will stand out among what many people see. Think About Fixture Integration – Will your countertops need to incorporate fixtures like sinks? If so, then you will need to make sure the distributors with whom you work offer those options.This is something to think about when you want to save on your Avonite cost because some distributors may offer the shape you need already while others might have to customize existing counters for your needs. Think About the Finish – There are a lot of different Avonite finishes on the market, and they all have different costs associated with them. Generally speaking, a matte finish will be far more affordable than a high-end gloss finish. Learn About Expected Lifespan – The kind of maintenance you’ll have to carry out is something you need to think about when inquiring about Avonite prices. Will it need continued upkeep? Will it have to be replaced in a few years? These are questions you want to ask as you shop around. Taking these considerations into account as you examine your options will help you save on your Avonite cost and get countertops that will truly complement your home. But who can you work with to make sure your design aspirations are met down to the smallest detail? When you need quality countertop installation service, the professionals of Express Countertops can make it happen. As one of the premier providers of solid surface countertops from brand name manufacturers, we can provide your home with a new kitchen countertop or a new bathroom countertop that will turn heads. Make sure people take notice of your home’s new fixtures by getting in touch with the professionals of Express Countertops today. 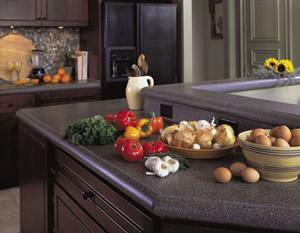 Call us today 410-712-0601 or click here to reach us online and we’ll help you save on your Avonite countertops cost. When you get in touch with us, we can discuss anything you want; from design, to colors, to price per square foot. You’ll get all the information you need so that you can get counters that are perfect for what your home!